In Los Angeles in 1976-1978 there was a band named Berlin Brats who made an appearance in the film Cheech and Chong's Up In Smoke as one of the bands in the battle of the bands segment towards the end of the film. The Berlin Brats recorded a single which made it to the test pressing stage but was never officially released, apparently. However, one song from the single made in onto the Saturday Night Pogo compilation LP that was released in1978. 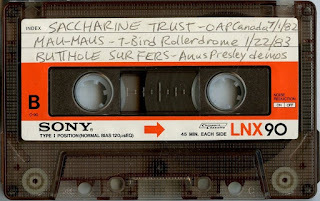 In that same year the band changed their name to The Mau Maus and played around California until the mid 1980s. They made some recordings but only two songs were released on the Hell Comes To Your House volume 2 compilation album in 1983. They also had two songs on a Target Video release in the 1980s. Here are two short live shows. The T-Bird show was recorded from the soundboard and has very good sound quality. The Reseda show is an audience recording and has good sound quality. Psychotic is the song from the Up In Smoke film and Laugh Track was on the Target Video. The others were unreleased.